Woot! I never liked the ribbons as it made it more difficult for me to find out when I was looking for a command. I found myself going to help and searching many times. Well, help is here. Microsoft seems to listen! 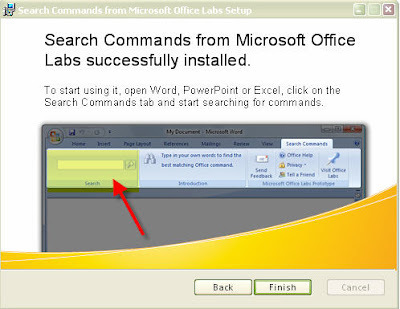 In their www.OfficeLabs.com site, they released a new toy called Search Commands, which makes finding command in office very convenient. Try it out, if you are one of those users annoyed by ribbons.